Since 1969 turkeys and paddleball players have united to create a tradition unlike any other here in local paddleball lore. It's the annual Thanksgiving Turkey Shoot at the Dow Bay Area Family Y. This year's 50th session saw twenty paddleball players climb the 31 steps to the four paddleball courts at the Dow Bay Area Y. After the Gatorade was gone and the muscle cramps commenced, the champs were crowned. Bay City's own Chad Krager and upstart Dan O'Shea are the 2018 Turkey Champs!! They defeated Bay City's Sanford Degreif and Karl Briggs of Freeland 20-21, 21-11, 21-14. Degreif & Briggs reversed the momentum during game one by flipping a 14-20 deficit with seven straight points for the win. 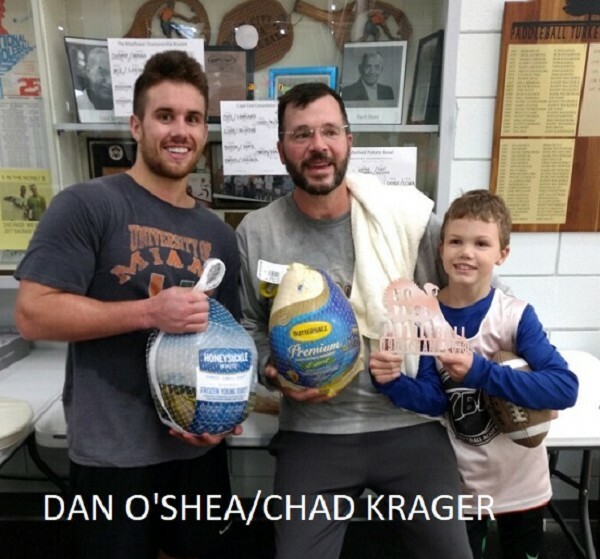 However, Krager & O'Shea stood tall and went back to the grind to regain the momentum and subsequent victories in the next two games to claim their turkeys. Dan is the second of the O'Shea family to capture a piece of Bay City Turkey Paddleball History, as his uncle Patrick won with Mark Piechowiak in 1998. The day started with 20-men in a round-robin affair whereby each person would rotate partners for 4 games to accumulate the most points. The top 8 went on for the Turkey Championship. The bottom 12 went onto the consolation brackets. In the Cape Cod consolation bracket, Bay City's Lance Krager Jr. and Ann Arbor's Jim Owens defeated Paul Carr (Lansing) and Doug McIntyre (Saginaw) 21-20, 21-7. The consolation-winners took home Cornish hens. In the consolation Mashed Potato Bowl, Bay City's Marty Doyle and Kirk Elsea splashed gravy on the hopes of Jason Beckers and Dan Gutzke in their 21-15 victory. Marty and Kirk actually won mashed potatoes! A special thank you to Nancy Powers! She has helped coordinate this tradition for about 45 years running now.